Lindsey was telling Jay I reminded her of "the dude" (Lebowski's moniker in this film). I'd never seen this, and my curiosity was again piqued, as it crops up as a cultural reference. Lindsey likes to re-watch her favorites over and over, so it took little encouragement to have her fetch her copy up from her basement lair. I like Jeff Bridges. Altered States was another one where-after some of my friends compared him to me. No wait, that was William Hurt. Thanks Don. 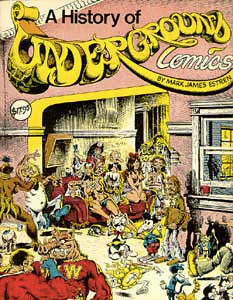 I'm currently rereading The History of Underground Comics. Jeff's character reminds me of a comic character. His life is a comic book, a storyboard, if painful at times. The usual rules of physics have been suspended in some ways. People bowl a lot more strikes. Or maybe it's the metaphysics that are different, or maybe it's just the 1990s. The bowling alley takes me back to White & Nerdy (Weird Al). Next we saw The Onion Movie, which Lindsey had grabbed off a free pile. Like comedy night at The Bagdad, the latter is inconsistent / experimental, toying with ideas we have limited agreement about (special interest, for focus groups). "Behind the scenes, Onion News's corporate owner, Global Tetrahedron, seeks synergy by promoting its other products within Norm's news broadcast." Monty Python territory in some ways, though many comics explore here, variously / philosophically. Jay was by because he needed to borrow my bicycle for awhile. His was stolen. We picked him up on our way from St. John's. Jay is a key player in our current Food Not Bombs configuration, which is in the process of reconfiguring. Like Melody, he has lived in Austin. Focus: architecture, anti-waste. This film recalls Kinsey in taking an anthropological view. The casting is almost too perfect, to where it becomes a cartoon, and in that sense a divine comedy. The Catholic priest is top of the line, if not over the top, in that regard. The film is structured as one long confession, but ultimately not a confession of guilt. This husband of the therapist has an interesting role. You'd probably need to be a philosopher to have that be your wife's day job. We only see him blowing up once, and even then it's fairly low key melodrama, and she gets to read the letter anyway. He's in the church with the rest of 'em, cleans up well. I like that they have her making tapes, reflecting into her 1980s cassettes. It's not set in the present. That's something of a relief. He lived to be about my age. A very not-scary film about kids wanting to grow up and see the world, yet getting resistence from an older generation that has already seen a lot of the world and is wanting to protect and shield... but not stunt. Daddy Dracula (Adam Sandler) has experienced the nastiness of humans. He's a misanthropist for a reason. Who can blame him? Vampires are clearly cooler. What's not to like about them? The animation goes back to the roots, skipping recent recastings, and doesn't even try to make Frankenstein different from the monster. Kid friendly, saw it at Avalon. Barry is the speaker tonight: How Cars Work? Really, fully grown adults getting together for that? Absolutely, that's Wanderers for ya. Some of us are "retired" but still busy all the same. Others of us are "working" (not the physics meaning). We went around doing intros, per usual. Holden is back from the UK. DiNucci (NASA, Humanists), musician Bunce (Ret.). Phil just coming through (he actually works here in the building, with an office and everything). Linus Pauling lived here as a kid, got into chemistry. Electroscientific Instruments and Tektronix both got a footprint here too, along "Asylum Avenue" (one of its chapters), called Hawthorne now (after one of the doctors who started the Asylum, closer to 12th). It's more about engines, which apply to boats, planes, trains and ships, not just cars 'n trucks. "Automobile" is any "self propelled vehicle" (translating literally). In the UK, steam powered vehicles on roads gave way to trains as the paradigm. External combustion engines. The fire is outside of the actual engine. Sterling engine similar. Hence solar sterlings, which Barry doesn't know about (Infinia's thing). Jet motor: fire on the inside. Wankels (rare today). Hardly any turbines in cars. Chrysler showcased a few. They're air / fuel pumps, and in the process make usable power. A horsepower = what it takes to raise 33,000 pounds one foot, in one minute. Barry's personal memory goes back a ways, and he's done a lot of research. His dad was a machinist. All these fuels: peanut oil... He's explaining a jet engine now... 747... Some thrust through the cowling. Chrysler's turbine cars had a bearing that cost as much as the rest of the car. Long discussion of two stroke engines, their advantages and disadvantages. Barry understands them well. They were never popular in cars. Saab had one, a three cylinder two stroke. Then he diagrammed the four stroke cycle. Then two stroke diesels. I remember wandering through the science museum in Munich (Munchen) marveling at all the different engines. Barry is like a tour guide from there. Screw type blowers make an appearance. New model engines are doing more to control the valves (variable valve timing, and lifting). OBDII (on board diagnostic version two) gives you hints about what to replace. Cam position sensor, knock sensor... lots to know. Lots of valve patterns too (Barry went through some history -- flathead, overhead cams, more overhead cams...). Wow, the Napier Deltic engine is pretty strange. Barry got through only about half his material. Maybe we'll do a Cars 2. Books for kids that I read, by Enid Blyton for example, would glorify meal time, and give detailed descriptions of dishes, which could be enjoyed by an imaginative reader. Not just visualizations were important. Not being a budding gourmet, I might get impatient with some of these passages, but at least I was reading them. Nowadays people get impatient with reading itself more quickly, and lingering over a description of a food is itself an acquired tasted. Like Enid Blyton novels. Lots of press for Alaska lately. Allen could have shaken me by the shoulders in the movie version, where everyone's a caricature of themselves. He's really quite low key. We'd been thinking of doing a cruise to Alaska with dad when then 2000 accident happened. "Just take a bag" he said, "too late to book a cabin." He's talking about the multi-stop inside passage ferry, where you get on and get off. Not enough bandwidth I'm thinking. But I like the sound of seeing glaciers again. Thanks to Mr. Blake for introducing my to Tumblr, through which I found the Hexagonal Awareness Project. Now that's a project after my own heart, dovetailing neatly with HP4E, Hexapents for Everyone. The "for everyone" trope, with a "4E" is not my intention. James Joyce had "Here Comes Everyone" (HCE), which I'd quote a lot, in my "human centers environment" writings, and then Guido came along with CP4E with DARPA funding, how cool was that. Just for IDLE though, nothing all that sinister. I got lots of mileage from IDLE, especially with Akbar font, as you'll find through these blogs (such as fragments exist). The HexaPent is well expressed as a spherical object, the soccerball most easily, which is also the pattern for C60, the "buckminsterfullerene" molecule ("fullerenes" the family). Romanticizing certain meats, as delicacies, praising their virtues. It's as if the cow life, soft and certain until a sudden end, were so popular with spirit world that we were seduced and enticed, as predators, to crave bovines, so that more and more could be made upon this Earth, and so it was. Bucky used to talk as if metals themselves had a voice and lobbied congress. In language, the nonhumans criss-cross, make waves, with ergotic egoid eddies bobbing in the way. The diets talk, share the carrots not their sticks. "Raw vegan magic" sings Lindsey, a good siren for the genre, my pleasure to shipwreck so nearby, in the arms of some steak. At the Bagdad the other night, the comedians were deep into food humor. I honestly don't think the guy going on about bacon-wrapped chicken wings knew of our pepto-bizmol colored bacon-flavored beer, made by Rogue for a donut company named Voodoo. Hard to top those economics. Excavating one's office can mean a lot of archeology. I'm vacating a multi-desk zone and setting up shop elsewhere in the building. It's a business decision. Renovations must occur. No one stays in that office except construction workers and me, continuing with demolition (that will be Phase 2). I've got the Raspberry Pi moved but not yet on the router. The Airbook is talking to the old Qwest DSL modem. That's enough to keep me busy. OK, I've just made sure the Pi is browsing now too. Melody is at our workplace, checking out the new shipment (from Montana), ordered by Lindsey. I was out at PDX this morning (airport).